Tavern or small shop. Factory A tequila factory or store where tequila is sold at retail prices. 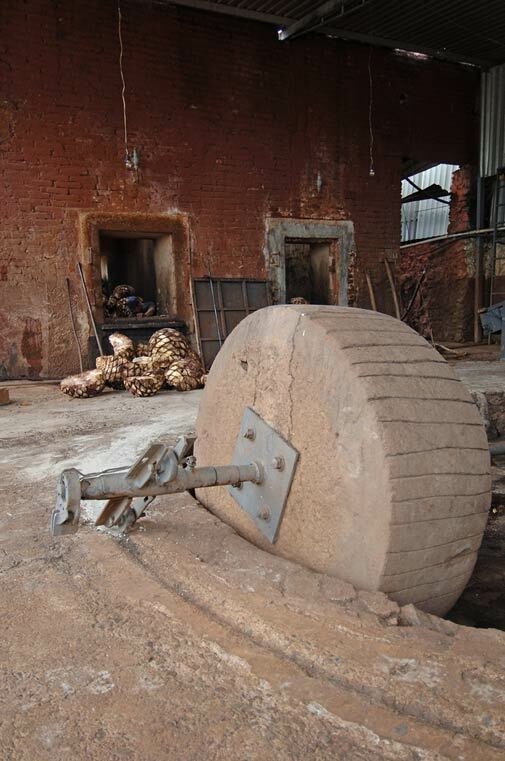 The traditional, large stone wheel turned by donkeys, oxen or tractors. It pivots in a circular space (often a cement well) to mash the pulp of the agave into a coarse paste and extract the juice (aguamiel). This is diluted with water to give it the necessary consistency for fermentation. Also see molina and noria. More pictures of a stone tahona. Roasting. The process of cooking the agave piña so the sugars within it concentrate for fermentation. Mild alcoholic beverage of Central and Northern Mexico produced by the fermentation of corn. It is similar to beer with bits of corn and it is the traditional drink of the Tarahumaras or Rarramuri Indians. Type. According to the Mexican regulations, there are five types of tequila - Blanco (Silver), Joven (Gold), Resposado (Aged), Añejo (Extra aged) and Extra Añejo (Ultra-aged). 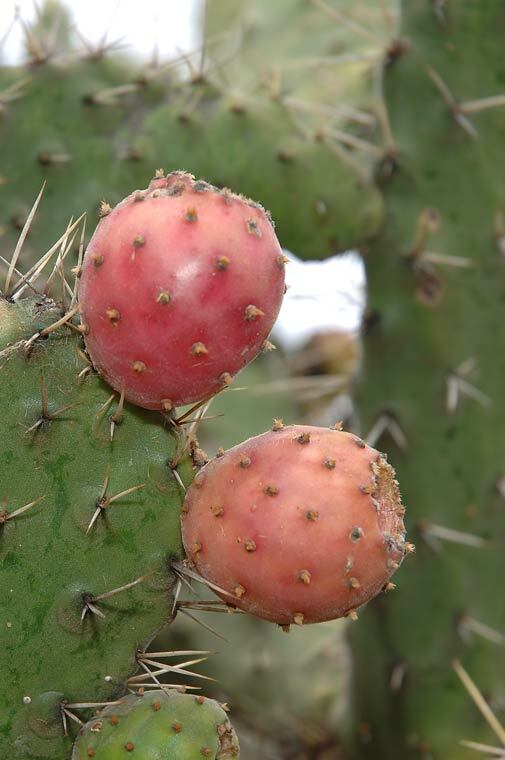 The fruit of the nopal cactus. It is served chilled with lime juice. A distilled spirit marketed throughout the world as a 35 to 50 percent alcohol by volume (ABV) beverage. It is fermented and distilled using sugars extracted from the crushed, starchy fibers of a single species of the desert-growing agave Tequilana Weber, the blue variety. Cut tequila, generally a mixto. When the tequila, after being shaken within the bottle, does not produce the pearl or conch (bubble) on the surface. The “Denomination of Origin” law has defined the area in which the blue agave is grown and tequila can be produced. It includes the state of Jalisco and some regions in the states of Guanajuato, Nayarit, Michoacán, and Tamaulipas. See also Denomination of Origin. Both the region and the town that gave the spirit of Tequila its name. The drink is named after this town in the state of Jalisco, in central-pacific Mexico, which was settled in 1656 and named after its early residents, a local Indian tribe. Tequila means “lava hill” in the Mexican-Indian language, and the agaves are grown on a dormant volcano. It is located roughly 40 miles northwest of its state capital, Guadalajara. Tequila made using the traditional oven to bake the piñas, and distilled in copper stills (alambiques). It is manufactured in a copper vat with a tub. The vat is covered with a piece of wood, covering the crevices with clay; the condenser is a wooden serpentine. There is no worm in a bottle of Tequila. The worm, or “gusano,” is found in the mezcal plant as an insect or pest. A master tequila maker, distiller, producer or anyone involved in the production of the spirit. The indigenous tribe that first settled near the Tequilán volcano, where the majority of blue agaves are harvested for Tequila production. The Tequilinos, also known as Tequiltecas or Tecuilos, were believed to be the first to harvest the agave plants primarily for medicinal purposes. Much later, their ancestors would find a better use for the plant. Cask. Wooden container for the transportation of liquids. Ancient measure equivalent to 833 kilos. Little Bull. A beverage from the state of Guerrero made from mezcal, vinegar, green chili, onion, tomato, and cheese. In Mexico and Morelos, it is tequila or aguardiente mixed with orange juice, onion, and chilis in vinegar. There are five types of tequila within specific categories - Blanco (Silver), Joven (Gold), Resposado (Aged), Añejo (Extra aged) and Extra Añejo (Ultra-aged). See also: Categories of Tequila. Workers who cut the piña from its root base and get it ready for transport. Stick, pole or measuring rod. One vara measures 0.836 meters or 2.8 feet. The residual waste waters generated through the tequila production process which contain pollutants. Make no mistake about it  there are no worms in a bottle of Tequila. The worm, or “gusano,” is found in the mezcal plant as an insect or pest. Later, this worm is often dropped in the distilled spirit, also called mezcal, which is a common spirit produced in Mexico. It is believed that the worm, a living being, would devour any evil spirit found in the mezcal. A	microscopic fungus that converts its food (carbohydrates) into carbon dioxide and alcohol through a metabolic process known as fermentation; yeast is necessary for making alcohol, beer, wine, cheese and some breads. It is added to the tequila mosto to induce fermentation. The yeast acts upon the sugars of the agave plant converting them into alcohol.